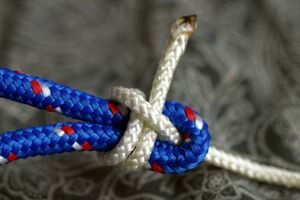 The double sheet bend is a strong knot used to tie two ropes (usually of different thicknesses or rigidity) together. It is a doubled version of the sheet bend. To tie the double sheet bend, start by making a bight in the larger line. Pass the working end of the smaller line up through the bight, around behind the bight, and beneath the loop in the smaller line (that's a sheet bend). Then once again, pass the working end along the same path, around behind the bight and beneath the loop in the smaller line. As with the standard sheet bend, the two free ends should end up on the same side of the knot. If they do not, a left-handed double sheet bend results, which is much weaker. This page was last edited on 18 November 2007, at 00:01.